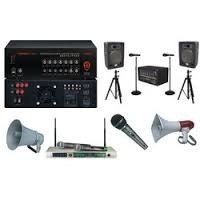 An Industrial public address system is also called Industrial PA system. This is an electronic sound amplification and distribution system with a number of field units and each unit having a microphone, built-in amplifier and loudspeakers. This enables a person to address various areas of the factory, a large gathering of factory staff and also for announcements of movements at large and noisy air, rail terminals and industries. Distributed type paging & Talkback system System Configuration: a). Handset Type of field station set includes the following 5 items: 1). Field station model: PPT9000HS (1 No.) 2). MS Enclosure (1 No.) 3). Station JB (1 No.) 4). Speaker JB (1 No.) 5). Paging Horn Speaker (1 No.) - Rs.26,000=00 Per Set. b). Pilferproof Type of field station set includes the following 5 items: 1). Field station model: PPT9000PP (1 No.) 2). MS Enclosure (1 No.) 3). Station JB (1 No.) 4). Speaker JB (1 No.) 5). Paging Horn Speaker (1 No.) - Rs.26,000=00 Per Set. c). Desktop station set includes the following 5 items: 1). Desktop station model: PPT9000DS (1 No.) 2). 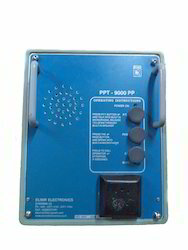 Power supply unit model: PPT9000PS (1 No.) 3). Station JB (1 No.) 4). Speaker JB (1 No.) 5). Paging Box Speaker (1 No.) - Rs.26,000=00 Per Set. Note: 1). Select any number of Handset Type of field station set or Pilferproof Type of field station set or Desktop station set or combination of all the three types as per requirement. 2). Rate & Delivery period for 3 types of cables will be sent on enquiry. Description: The system consists of a number of wall mounting stations either Handset type or Pilferproof type or a mix of both - located at various places. Each wall mounting station is extended 230 V AC / 110 V AC or 24 V DC depending on the input power supply setting. Cables : The system requires the following types of cables. a). Signal cable: 6 core, 0.5 sq. mm ATC over all pvc sheathed armoured cable for audio signal inter-connection. b). Power supply cable: 3 core, 1.5 sq. mm ATC overall pvc sheathed armoured cable for power supply connection. c). Loudspeaker Cable : 2 core 0.75 sq.mm ATC overall pvc sheathed armoured cable for inter-connecting the paging unit with the loudspeaker. 6 core armoured cable is laid between each and every wall mounting station and terminated in the station junction box and the cable terminals are inter-connected to the wall mounting station. The power supply cable is laid between each and every wall mounting station and terminated in the station junction box and the cable terminals are inter-connected to the wall mounting station. The amplified page power output of each wall mounting station is connected to a unit horn combination speaker through a speaker junction box. Operation of the system: When a person wishes to page another person, he lifts the handset, holds the Page switch & announces the person to be contacted. A gong tone precedes every announcement. The announcement is heard through all speakers connected to the wall mounting stations; the called person goes to the nearest paging station, lifts the handset and responds to the call. At this moment the calling and called persons get connected in private conversation mode i.e., the discussion among them is only heard in their handsets and it is not heard publicly in the loudspeakers. The system is ready for some other person to make a page call. 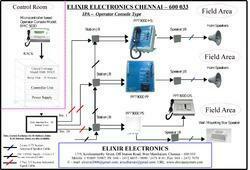 This type of operation of Industrial Public Address system is known as DISTRIBUTED TYPE OF SYSTEM . In this system of operation, there is no operator and the personnel at every station can page and communicate on their own. 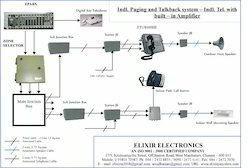 Audio Communication System - Industrial Telephone with built-in Page Amplifier This system consists of an Epabx unit located in the control room. 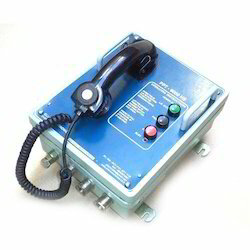 All the field industrial telephones have built-in page amplifier and are provided with a noise cancelling type handset. These are connected to the EPABX unit. 230 V AC power supply is extended to the EPABX unit. The field operator lifts the handset and dials the required extension number. The input stage senses the incoming call and shifts the line to page amplifier board. The ring back stops and the calling party makes the paging announcement through his telephone. This announcement is amplified in the particular field call station (FCS) and heard through the page loudspeaker connected to it. 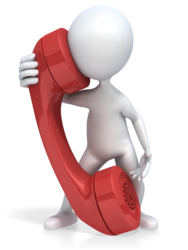 If the called person picks up the FCS handset while the announcement is in progress, then the calling and called persons get connected for conversation in pvt. Mode. In case the calling person disconnects the line after making the page announcement, the called person can dial the no. of the earlier caller from any FCS, make a page announcement and proceed to talk to him. The master operator can, through the operator console 1). Access all the field call stations individually 2). Make zone wise page announcement 3). Make all zone announcement. The Field Operator of any FCS can 1). Make a page announcement to individual FCS 2). Make zone wise page announcement (except the zone in which the particular FCS is included) 3). Make all-zone page announcement (except the zone in which the particular FCS is included) Other standard features of a digital system are available in this epabx system. Pricing Details : 1). EPABX Unit - 25 Extensions - 1 No. - Rs.2,00,000=00 each. 2). Indl. 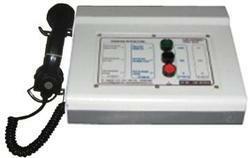 Telephone with Built in Page Amplifier - Elixir Model: ETU8000HS - Qty as Reqd - Rs.20,000=00 each. 3). Zone Selector Unit - 1No. - Rs.50,000=00 each. 4). Desktop Telephone (commercial version) Amplifier & Speaker - Qty as Reqd - Rs.20,000=00 each. 5). Telephone cables - 2 pair, 5 pair, 10 pair, 20 pair etc. - On request 6). VAT Extra. We are a trusted name in the industry for manufacturing and supplying of Industrial Public Address System.The offered product is highly regarded for its unparalleled features and durability. It is used in industries for addressing huge number of workers for proper streamlining of the production unit. The offered handset is provided with a highly sensitive noise cancel device for ruling out background disturbances. This unit is part of the distributed type of paging system and also central exchange operator based paging system. These 2 types of paging systems are explained in detail in this product group. The model PPT9000HS - Handset type paging and talk-back field units - is compatible with existing models of handset paging units. Hence PPT9000HS can be used to replace existing defective units and the system will work perfectly without any adjustment. PPT9000HS can also be used for expansion of existing paging system and the added units of PPT9000HS will work with existing units without any adjustment. Enclosure LM6 Aluminum alloy - Hence suitable for use in highly corrosive areas. The offered Desktop unit is provided with a noise cancelling handset for ruling out background disturbances. The model PPT9000DS - Handset type Desktop paging and talk-back control room unit - is compatible with existing models of handset paging units. Hence PPT9000DS can be used to replace existing defective units and the system will work perfectly without any adjustment. PPT9000DS can also be used for expansion of existing paging system and the added units of PPT9000DS will work with existing units without any adjustment. 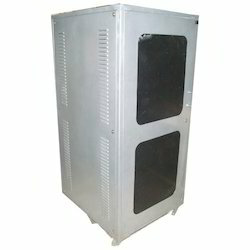 This unit is supplied with power supply model PPT9000PS as a standard accessory. Enclosure MS powder coated as the unit is always used in indoor areas. Central exchange type paging & talkback system : The Microcontroller based central exchange paging & talkback system consists of:a) Desktop operator console with LCD;b) Central exchangeMicrocontroller unit for 20 FCSs;d) Power supply unit in 19 sub-rack & Rack assembly for mounting the items b, c & d. Desktop operator consoleMicro controller based-with LCD display: Selective, Conf., Group,All call, Emergency siren, comm. with the FCSs in different groups, Date / Time Updation, standby operation, Alert Tone & Display of calling FCS ID (No. ), soft keypad, Ergonomic design are the main features. Available in 20/40/60 FCSs/Zones versions. Powder coated MS enclosure provided. Available in Handset / Gooseneck mic models. Cables : a).Signal cable - 6 core 0.5 sq.mm ATC overall pvc sheathed armoured cable;b).Power supply cable - 3 core 1.5 sq.mm ATC overall pvc sheathed armoured cable:c).Loudspeaker Cable - 2 core 0.75 sq.mm ATC overall pvc sheathed armoured cable. Connection: 6 core 0.5sq.mm ATC armoured cable from each FCS is terminated at the MJB. The MJB has terminals for connecting page,private & FS cables. The power supply is extended to all FCSs. The page o/p of each FCS is fed to the page horn speaker thro' a speaker junction box. System Operation: 1). FCS to Master Control Station (MCS): To talk to operator, the field person lifts the FCS handset & presses the FS switch. An audio beep & a blinking LED attracts the attention of the MCS Operator. The numeric ID of the calling FCS is also seen in the LCD in the MCS. If more than one FCS is calling the MCS operator, all the numeric IDs of the calling FCS are on the LCD. Simultaneously an audio beep and a blinking LED is also present. The MCS operator determines the priority by which the FCS are to be contacted. Accordingly he selects the particular top priority FCS from the calling FCS units. The operator converses with the selected FCS in private Mode. Once the call with the FCS is over, the MCS operator selects the next FCS on priority. 2). MCS to FCSs:To talk to a particular FCS, the MCS man lifts the handset & keys in the numeric ID of that FCS; an announcement is heard thro' the page speaker of that FCS. If the FCS operator is nearby, he lifts the handset of the FCS and converses with the MCS operator in pvt. mode. Once the call is over, the handsets are put back in normal position. An alert tone precedes all paging announcements from the console. 3). FCS to FCS : FCS in a particular group/zone can call on page mode the FCSs within the group / zone and converse in private mode. The basic operation of page & party conversation within the zone can be done by all the FCSs in the zone. Whenever a page announcement is made from the zone, it is heard in all the speakers of the other stations in the zone. The wanted person can go to the nearest FCS and talk in private mode. The private conversation now taking place can be heard by any other FCS operator in the zone and can take part in the private conversation, if necessary. The existence of private conversation can be seen by the glow of private LED in all the field stations irrespective of whether a particular FCS operator is taking part in private conversation or not. 4). Additional functions by MCS operator: a). The MCS operator can call a group or groups or all the groups & make a page call or any other announcement as required. An alert tone precedes all paging announcements from the MCS. b). The MCS operator can initiate a siren which will be heard through the page loudspeakers in all the FCS. c). The MCS operator can initiate safety messages thro' an interface unit. * Price indicated is for 1 piece of Central Exchange MCS MJB. the general PA Amplifier and also through the talkback system. and the output of the telephone coupler is fed to the amplifier. stops, speaks through the telephone handset. of the talk-back system and heard through all the page loudspeakers. * The telephone coupler unit works on 230V AC supply. Our organization is a trusted name in the industry for manufacturing and supplying PA System Racks. The product is highly regarded by our clients for good quality and features. It is ideal for addressing public in auditoria and huge stadia. This system is used to accommodate an array of audio amplifiers, audio consoles, power supply and zone monitoring speaker. It is cost effective and can be supplied in bulk as well. Looking for Industrial Public Address and Paging _Talk-Back Systems ?